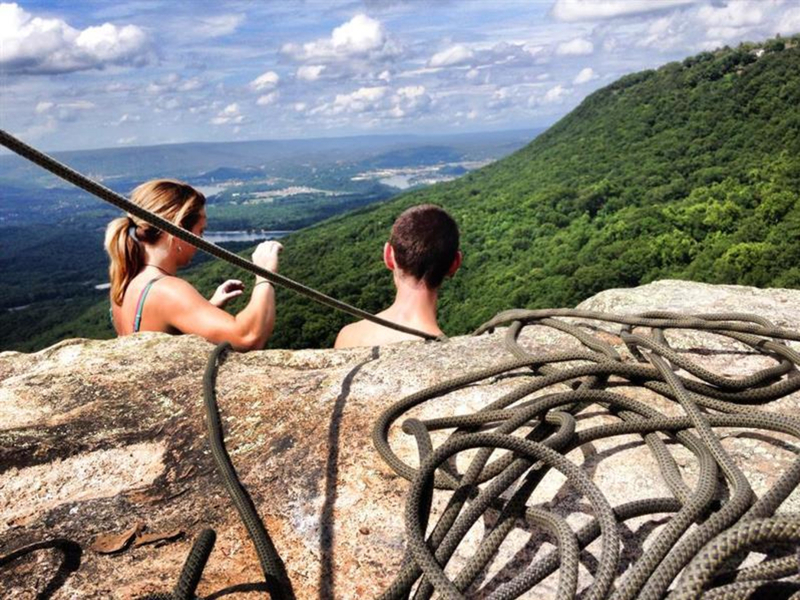 Classic trad climbing routes near Chattanooga, TN on Lookout Mountain. 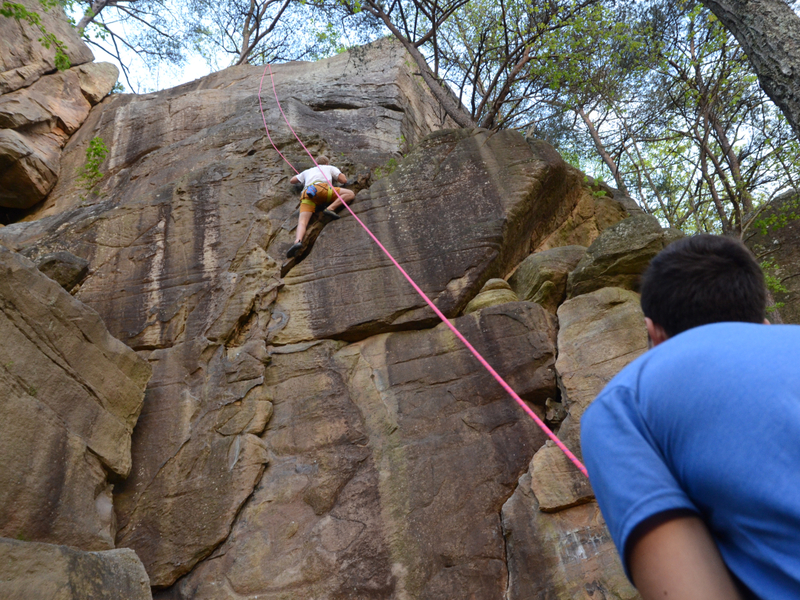 If any crag can be considered the "Crown Jewel" of southern sandstone climbing, Sunset Rock surely must be it. 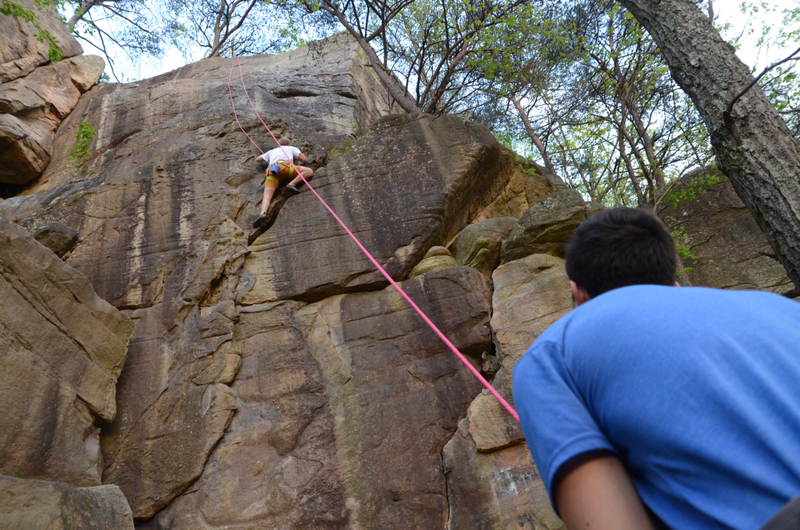 Located on the west brow of Lookout Mountain, as part of the Chickamauga National Battlefield Park, Sunset is considered the "cradle" of the Chattanooga climbing scene. It was where most of the leading sandstone route activists first cut their teeth and pushed the standards of difficulty. One visit to this area and you'll know why: exquisite rock, friendly approach, and lots of high quality routes. Sunset Rock is a long, linear cliff line that runs along the bluff on the north side of Lookout Mountain. It is shady for most part of the day, making it a bit chilly in winter, but fairly comfortable in summer. You'll get some of the best views in Chattanooga, looking over the Tennessee River as it makes a turn around Moccasin Bend. On the approach, you will pass a number of routes, some of which are closed to climbing, until you reach the base of Sunset Rock. This buttress offers traditional routes in all difficulties that can be easily top-roped or led. Note: There are no bolted sport routes at Sunset.In addition, this small guide excerpt includes the next routes lying a hundred yards to the north along the trail, stopping at One Ten, a very popular moderate warmup. 22. *Total Eclipse 11cStart: 10' left of Flagstone. Pull past a short, black roof, then follow a short, steep finger crack. Finish on Flagstone or Carte Blanche. Start: 5' left of pitch two of Rusty's Crack. Power moves and poor gear lead out an overhang. Finish up the exposed headwall. FA: Forrest Gardner and Rob Robinson, 1983. 100' of fun climbing-sideways! Start: 15' left of The Prow, at a left-facing corner. Traverse right along an obvious, horizontal crack system, staying 10' to 15' above the ground, to the base of Alpha Omega. Can be done in either direction. FA: Rob Robinson, 1980. Start: 20' left of The Pearl.P1: Vibrate up an awkward chimney, then move right to a ledge with a small tree. 30' (4) P2: Climb a gully, past a roof halfway up. 40' (6) Continue down the trail about 100 yards to an obvious rock wall along the trail. An excellent choice for novice leaders. Climb a left-facing dihedral. Move left through bulges, pulling through a notch in the obvious overlap. Finish through a slot to the top. 60'. From the parking area, a quick 5 minute walk leads to the base of the main overlook, Sunset Rock proper. This is federal land operated by the National Park Service, and it's located in a very nice neighborhood. As a result, you will be noticed. Please be respectful of the people who live here, as they have a loud voice when access issues arise. Help us keep this place open for the next generation!